46 by project Gibraltar at USJ9 Subang Jaya. 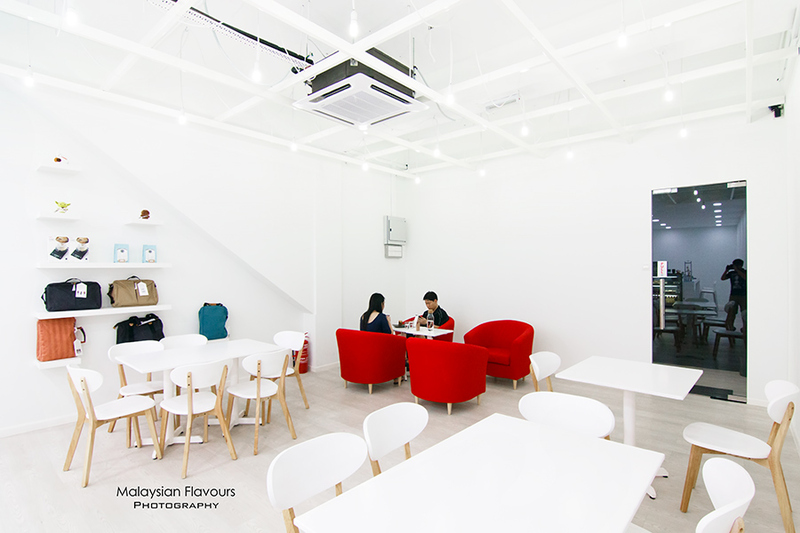 We finally found an “all white” cafe that allows us to happily throw away our doubts on where to sit every time we enter a cafe, especially when the place is heavily designed with high ceilings, dark walls , low lights, closed-environment that has less natural lights. Apparently, 46 by project Gibraltar is different, appears “white-at-all-angles”, thanks to the white ceiling, white lamp, white tables, white chairs, white shelves, white coffee bar counter. A touch of vibrant red from the sofa, wooden chairs’ legs for a lively finishing. 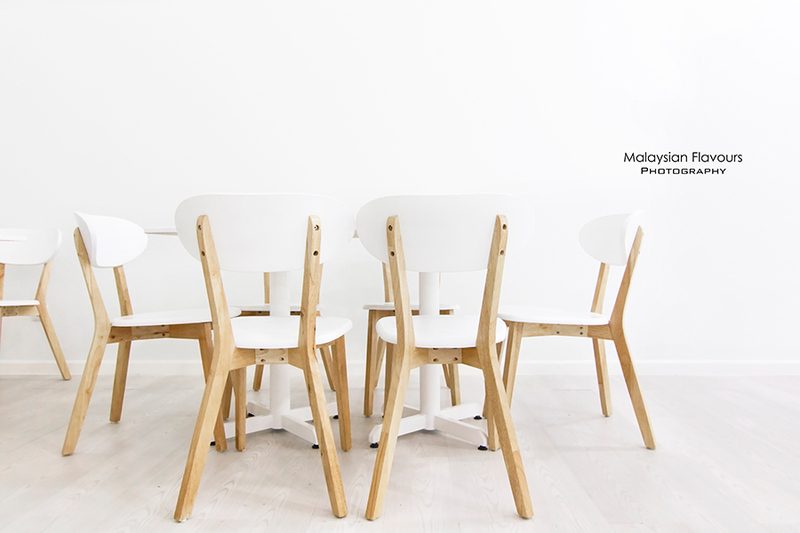 Minimalism, clean look, good for photography. 46 indicates the lot number of 46 by project Gibraltar, which is same row with Meteora Cafe and Go Espresso by Go Hotel. There is currently no shop sign up for the cafe, but you can hardly miss their impressive shop front. Floor-to-ceiling divider laced with red lining, a portafilter as door knob, leading you to an unexpectedly dreamy white scene. 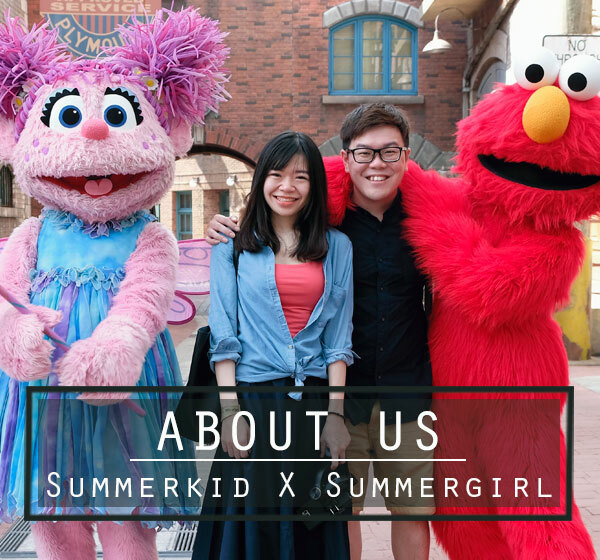 In case you still can’t find, it is beside SUMO Japanese Restaurant, opposite to Ah Koong Fishball Noodles. 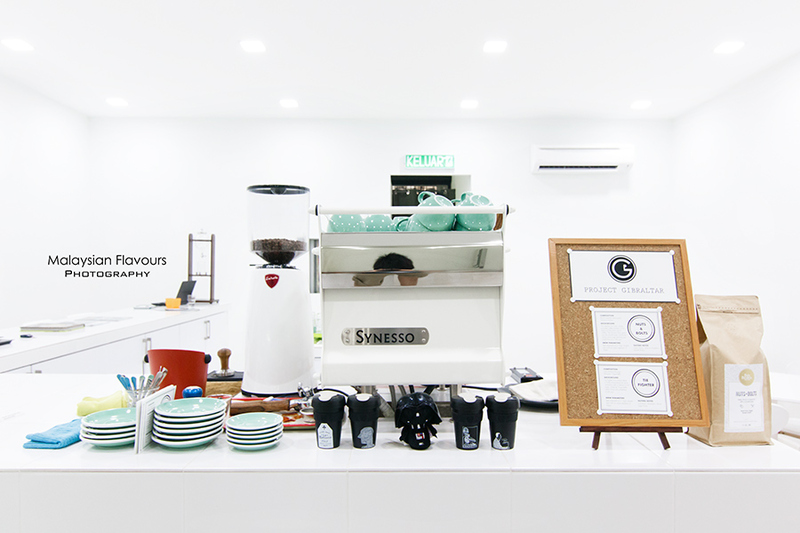 Putting aside the cozy ambience, specialty coffee takes the limelight in 46 by project Gibraltar, gracefully pulled using Synesso Hydra Single Group Espresso Machine. 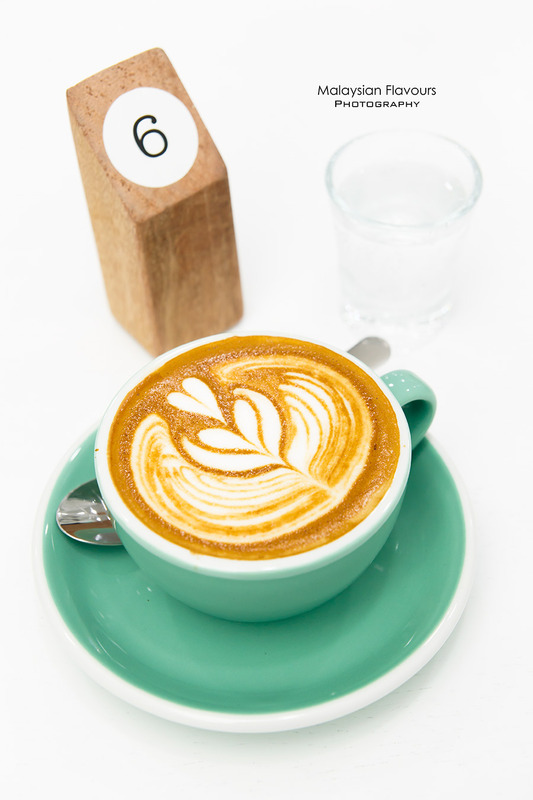 Straight forward basic beverage list – Kalita Wave Filter Coffee using hand-dripped method, espresso, espresso with water, or espresso with milk, mocha, affogato. Priced within RM7 to RM12. For something more interesting, sweeter, patrons can check out Nutella Cappuccino and Espresso Coke Bomb from Specialty Drink; Espresso Based Milkshake like Lavender Flower Pot Milkshake, S’more Espresso Milkshake, Salted Caramel Espresso Milkshake. All at RM13. Not into coffee? 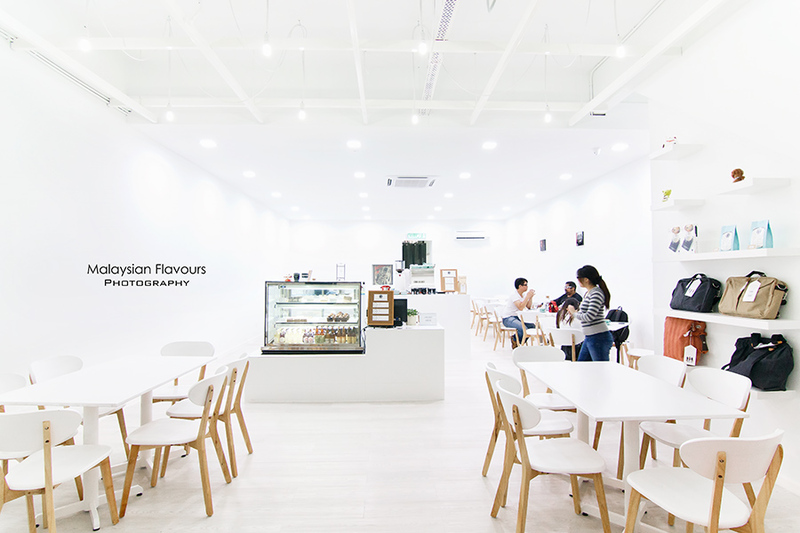 46 by project Gibraltar serves English Breakfast tea, Earl Grey tea, Green tea, Chamomile Flowers tea, Lapsang Souchong tea from Dilmah Loose Tea Series too. Good to see imported craft beer and cider here. Brewdog from Scotland, Hitachino Nest from Japan, Mountain Goat from Australia, Val De Rance Cider from France are by far the selections you can get here. For coffee beans, Seraph Awaken, roaster from Klang comes into collaboration to produce Tie Fighter for 46 by project Gibraltar. It is a unique blend of India showcasing spice aroma of cinnamon with sugar brown finish. 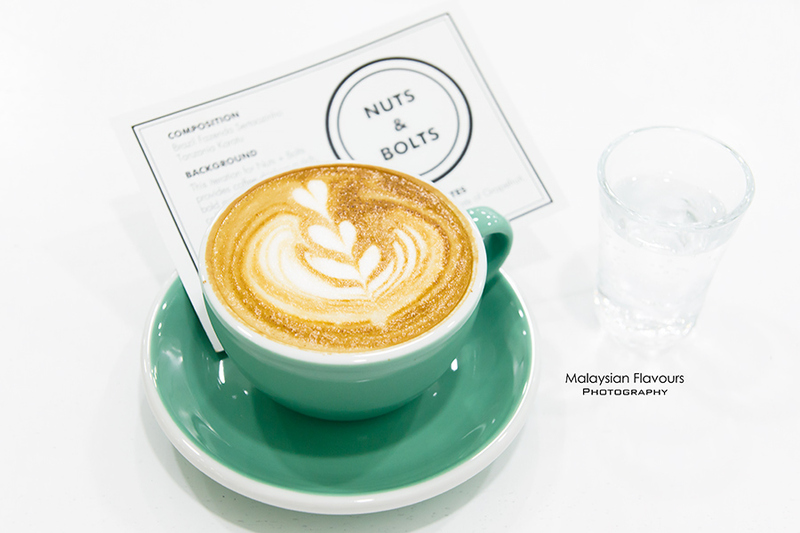 Nuts & Bolds by Papa Palheta is also used interchangeably for a cup of rich, bold, and flavorful coffee. We thought of having dessert pizza during our visit, but we were told that they aren’t serving it anymore. Pretty sad. You can still have Mille crepe, cheese cake, chocolate truffle cake from their cake counter if you need a sweet treat. Not sure if there would be any brunch or lunch choices such as big breakfast, egg benedict, pasta, pancakes, waffles in future, however we saw the kitchen has starts churning out croissant with egg & ham for savory menu. 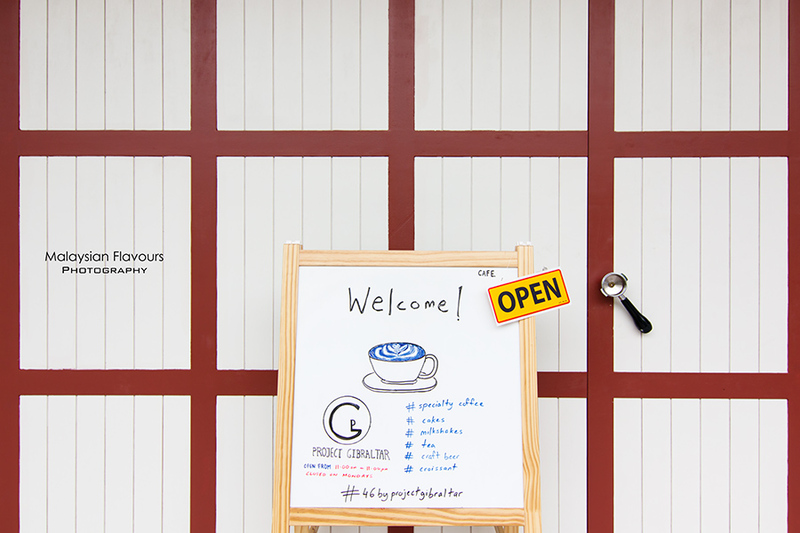 In short, 46 by project Gibraltar is yet another neighborhood coffee place for caffeine fix. Friendly service, coffee pulled with passion. We were surprised with the sparkling water that served along with our coffee, which acts as palate cleanser. So thoughtful.